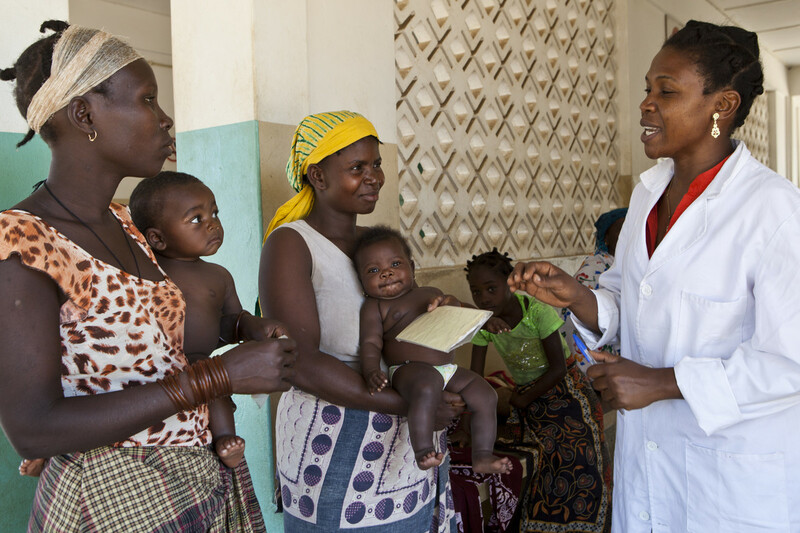 Maternal, newborn and child health (MNCH) in Mieze, Cabo Delgado, Mozambique. 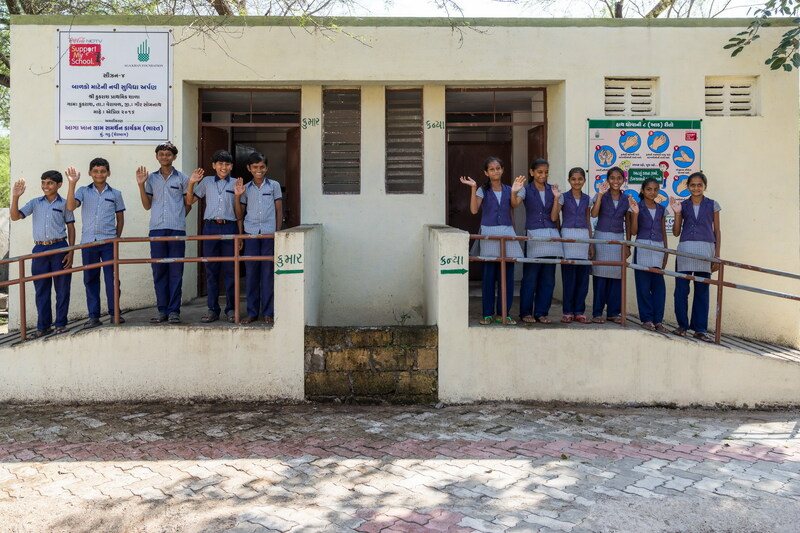 School supported under the AKDN Comprehensive Sanitation Initiative, Kukras, Gujarat, India. 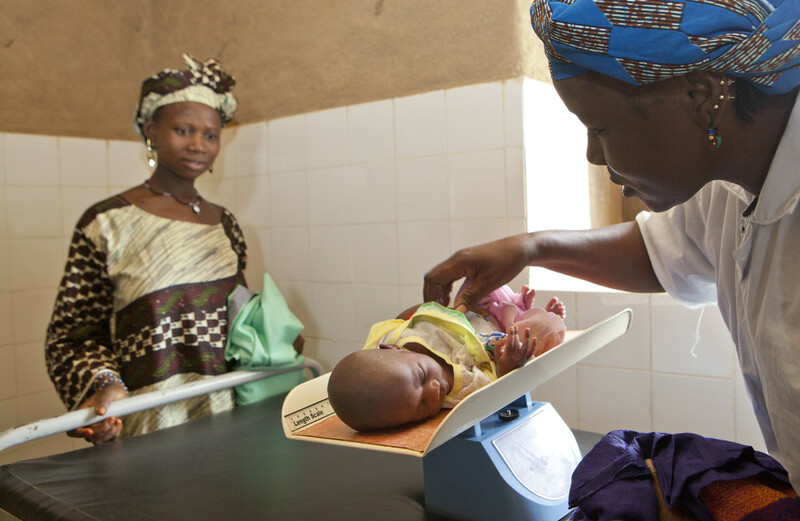 The cases de santé which AKF helped to establish in Mopti, Mali have helped to dramatically reduce the incidence of maternal and newborn death. AKDN works to improve a community’s health by integrating behavioural change in its related programme. 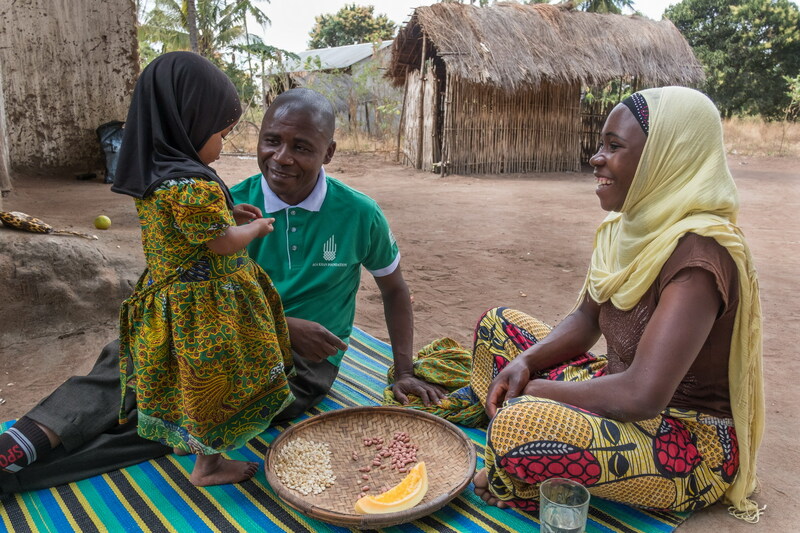 In Southern Tanzania, the AKF Coastal Rural Support Programme (CRSP) raises awareness amongst families about the importance of proper nutrition, especially for young children whose growth and development depend on it. Globally, at least 400 million people lack access to essential health services. Every year, more than one-third of them suffer financial catastrophe due to out-of-pocket healthcare expenditure. Millions more living in marginalised and resource-poor geographies still rely on unclean, unimproved water sources. As one of AKDN’s three key agencies in health, the Aga Khan Foundation (AKF) harnesses its longstanding work with communities and village organisations to enable people – particularly those living in geographically remote areas – to optimise their health and well-being, and reach their full potential. It seeks to achieve sustainable improvements in health and nutritional status amongst vulnerable groups, especially women of childbearing age, adolescents and children under five. Its goal is to improve access and utilisation of integrated healthcare services, while enabling communities to adopt effective health practices. Worldwide, AKF supports health and nutrition services that reach over 800,000 people. Nutrition groups in Pitolia, Cabo Delgado, Mozambique. The Foundation works to reduce the burden of illness while working towards achieving universal coverage by building a competent corps of community health workers whose knowledge and skills can help ensure better health status amongst families living in remote areas. These health workers receive ongoing trainings, materials and supervision to help them gain trust and relevance with communities over time. As this process is central to achieving health gains in the geographies where AKF works, the Foundation takes deliberate steps to retain these health workers over the long-term. For example, it strengthens civil society support groups and ensures linkages to livelihoods and other relevant programmes. AKF helps reduce the burden of illness at community level through improved knowledge of positive health, hygiene and nutrition behaviours and practices through robust behaviour change communication strategies and community engagement. AKF also works to expand the reach of primary care services by supporting and scaling-up of community case management and strengthening community monitoring and referral mechanisms. AKF works to reduce the burden of malnutrition at community level through support for improved knowledge of positive nutrition behaviours and practices, including support for strong infant and young child feeding practices at the household level. AKF also works to reduce micronutrient deficiencies through food-based approaches, as well as community-based micronutrient supplementation and de-worming. AKF supports community-based screening for malnutrition and improves access to and referrals to nutrition treatment programmes. School supported under the AKDN Comprehensive Sanitation Initiative in Kukras, Gujarat, India. Adopting healthy habits as a child brings lifelong benefits. For this reason, AKF works with not only communities and families but also with local schools, to help motivate young students to adopt routines that lead to better health and well-being. The approach builds greater awareness around positive nutrition, hygiene behaviours and lifestyles. It develops life skills, facilitates leadership opportunities, helps reduce tobacco and substance abuse, and includes injury awareness and prevention curricula. The Foundation helps increase access to clean water and promotes better sanitation and hygiene practices. For girls, this is particularly important as it impacts both their health and education. AKF provides nutrition education in schools and nutritional screening for all adolescents. Students who are undernourished are referred to treatment programmes, while support is provided to their households for how to address the problem. AKF also supports in and out of school micronutrient supplementation, and in areas with high stunting, AKF works with partners to implement nutritional supplementation. According to the World Health Organization, up to 1 out of 5 children and adolescents experience mental disorders. To address and prevent mental disorders common to adolescence, AKF implements school-based intervention programmes that involve training teachers, faculty and students. eHealth solutions increase access to specialty health care services for remote communities by providing low-cost and high-quality diagnosis and treatment services through teleconsultations, and build the clinical and managerial capacities of health professionals through eLearning. AKF strengthens links between facilities and their communities, including outreach and mobile services and referral mechanisms. It encourages marginalised people to access services through innovative and equitable health financing, including domestic health investments. AKF also works to strengthen the provision of public primary health care, and works with public and private providers to address exclusion of the most vulnerable to services. AKF works with primary care providers to ensure adolescents have access to quality, adolescent-friendly primary healthcare services, with an emphasis on community based and first referral level care. This includes supporting care providers to ensure non-judgemental, confidential services for young people. AKF fosters health system linkages through school health services and encourages routine health service use for check-up, screening and immunisations. AKDN operates one of the largest non-profit private healthcare systems in the developing world. This system includes basic health centres as well as internationally accredited research hospitals, a state-of-the-art Heart and Cancer Centre, and quality graduate medical education and training. AKF plays a key role in supporting the development of efficient and appropriate regional health systems, working with other AKDN agencies involved in health, namely the Aga Khan University and Aga Khan Health Services. An Aga Khan Foundation (AKF) and Ivoire Coton supported water pump, Kantara, Côte d'Ivoire. Alongside other AKDN agencies, AKF works with communities to develop sustainable water supplies and sanitation. By promoting the effective management of productive water resources, it works to prevent waterborne and water-related diseases. AKF works to improve water and sanitation coverage across health care facilities for infection prevention and control; and for women and girls to have safe access to latrines without fear of violence.